Polydicyclopentadiene (pDCPD) is an engineered thermoset polymer possessing an excellent combination of chemical and corrosion resistance, stiffness, impact strength, and heat resistance. pDCPD delivers the molding flexibility of a thermoset, but with characteristics similar to expensive engineered thermoplastics. Osborne has over 20 years of experience molding pDCPD and molds parts using a range of Telene® DCPD resins with a wide range of Reaction Injection Molding (RIM) equipment to meet your most demanding production requirements. We bring technical expertise in pDCPD chemistry, a fully equipped and highly trained staff of pDCPD specialists, and the skills of dedicated craftsmen to help transform your engineered plastic concept into reality. pDCPD is prepared by polymerizing low-viscosity DCPD monomer in low-pressure processes that enable the use of low-cost molds and fast cycle times. Low-viscosity means that pDCPD gives excellent replication of surface features for aesthetically demanding applications. Additionally, pDCPD gives superior paint adhesion and durability for appearance parts. pDCPD is used on numerous other applications wherever large, tough, corrosion-resistant, and aesthetically pleasing appearance is required. The design freedom of pDCPD has virtually no limitation on part size or weight. Parts with thickness from 0.100-inch (2.5 mm) to 12-inches and with a surface area from 1-ft2 (0.1-m2) to 140-ft2 (13-m2) are made successfully. Parts with variable wall thickness and molded stiffening ribs are possible. Molded bosses and fasteners reduce secondary assembly operations. Good adhesion and machining quality extend the usefulness of pDCPD parts. Corrosion resistance is another beneficial characteristic of pDCPD, which has been used in the chlor-alkali industry for more than 20 years. Thermosets like pDCPD are distinguished from thermoplastic materials, the other main group of plastics, because, unlike thermoplastics which revert back to liquid form under excessive heat, thermosets will remain in a post-cured form. pDCPD and other thermosets resist melting because of the process by which they’re created: Two dissimilar liquids are mixed together, creating high temperatures that foster cross-linking between molecular chains. This cross-linking contributes to thermosets’ heat resistance. 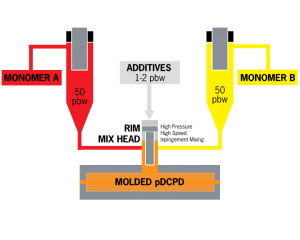 RIM-molded pDCPD parts are created through a process that begins when two liquid reactants – an isocyanate component and a polyol resin mixture – are held in separate tanks at an elevated temperature with agitators. These liquids are fed through supply lines at high pressure to the mixhead. When the injection begins, valves open in the mixhead and the liquids enter a chamber in the mixhead at high pressures (usually between 1,500 and 3,000 psi) and high speeds. Here they are mixed by high-velocity impingement. From the mix chamber, the mixed liquid flows into the mold at atmospheric pressure and undergoes an exothermic chemical reaction, forming a polymer in the mold. Dicyclopentadiene (DCPD), a liquid monomer, is catalyzed by an active metal component via the ring opening metastasis polymerization (ROMP) process. The monomer and catalyst can be mixed by hand or by Reaction Injection Molding (RIM). We use two different metal-activated catalyst systems that allow for unique mechanical properties, which are customizable for given projects. The liquid DCPD monomer also can be combined with several additives to create specialized resin formulations. Osborne’s pDCPD molding via reaction injection molding (RIM) includes equipment and low-cost composite or aluminum RIM molds that offer the production flexibility you need for your most demanding projects. What is the difference between Injection Molding and Reaction Injection Molding (RIM)? Injection molding is a process where a thermoplastic polymer is heated to its melt temperature and injected into a mold at high pressure and rapid flow rate. The injected polymer is then cooled to point where the part has enough green strength to be removed from the mold. Reaction Injection Molding is a process where two different liquid polymers are simultaneously mixed and injected into the mold. The two liquid polymers react with one another to form a solid polymer. The reaction between the two liquids is exothermic in nature and requires this excess heat to be removed from the mold during the injection process.